A few months ago I heard about a new data mode from Joe Taylor, K1JT called JT9. I looked into it and even tried calling CQ a few times on 40m using it but with no replies and no sign of any activity. I quickly gave it up as a bad job but before long I started seeing twitter posts and blog entries about this new mode. It seems that when I first looked at it, the only way to get a QSO was by sked because it was so new and there were so few people using it. JT9 has some similarities with JT65A – It’s designed for LF and HF work and will decode very weak signals. However JT9 in the most common mode will decode signals 2dB weaker than JT65 and it uses just 15.6Hz bandwidth which is less than 10% of the bandwidth that JT65 uses. JT65 users will appreciate that this is very good as it can often be difficult to find a clear spot to operate due to the popularity of this new mode. JT9 has five different modes, the fastest allowing a QSO to be completed in six minutes, the same as JT65 and the slowest taking up to 30 minutes per transmission period (up to three hours for a single QSO) and using just 0.4Hz bandwidth. Most QSOs will be made using the fastest mode. I tried JT9 again just over a week ago and I was making QSOs straight away – In one session I counted over 12 stations all showing in the waterfall at the same time so there’s a lot more activity than when I first started. It’s well documented in my blog that my first ever QSO to VK land was using JT65 on 40m so I was very pleased to work VK7BO (same operator, different callsign) on 20m JT9 on just my fifth day of using the mode with nice big signals each way. With JT65 I normally ran 10-20 watts but I’m keeping my power down to 5w for all JT9 QSOs. 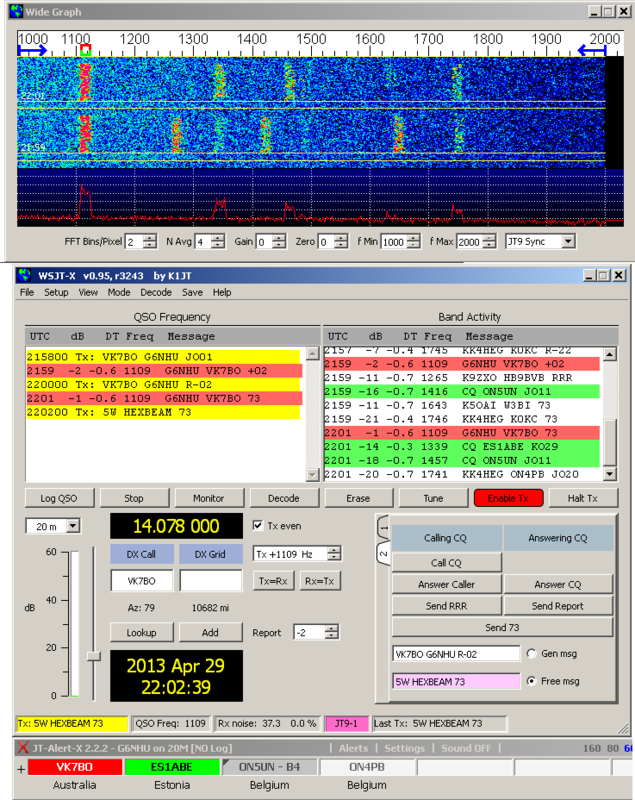 The JT9 mode is implemented in the WSJT-X software which can be downloaded from here. I thoroughly recommend you have a good read of the user guide before you start using it as everything you need to know is in that guide. It’s very similar in operation to JT65 as can be seen above. This entry was posted in Amateur radio, Data, HF, JT65, JT9. Bookmark the permalink. 3 Responses to JT9 – JT65 on steroids? 3 hours for a QSO? I’d have time to nip to the shops, go and wash the car, come back just in time to say 73. I can’t see me being too keen on that, but the 6 minute QSO wouldn’t be too bad. I’m just getting to grips with PSK at the moment, so maybe I will have a look at this mode as well. I agree Dave, I can’t be doing with the slower modes – They’re really intended for the new VLF bands though so not suited for normal contacts. If someone’s that weak then I’ll pass on the QSO! I think the long term contacts would be only used in very difficult conditions. I like to compare it with the navy comms with submarines, very slow with just the barest info.